The Seven Wonders of the Ancient World is the first known list of the most remarkable man-made creations of classical antiquity, and was based on guide-books popular among Hellenic sight-seers and only includes works located around the Mediterranean rim. The number seven was chosen because the Greeks believed it to be the representation of perfection and plenty. Many similar lists have been made, including lists for the Medieval World and the Modern World. Since this is a Buddhist list, eight are chosen here (The Noble Eightfold Middle Path makes 8 a significant number). There are numerous landmark Buddhist sites, so to help narrow down the list, this list focuses on the early teachings of Buddhism; the Theravada. 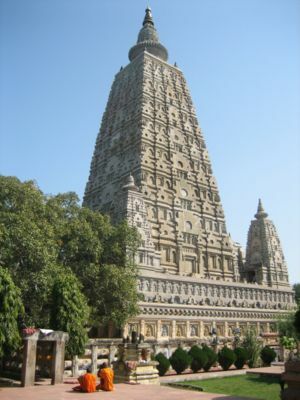 The Maha Bodhi Temple in Bodh Gaya, India marks the sport where the Buddha attained enlightenment. It was most likely first built by King Ashoka in the third century BCE. It is the holiest place in Buddhism, due to the fact that this is the place of enlightenment, the goal and purpose of the Dhamma. 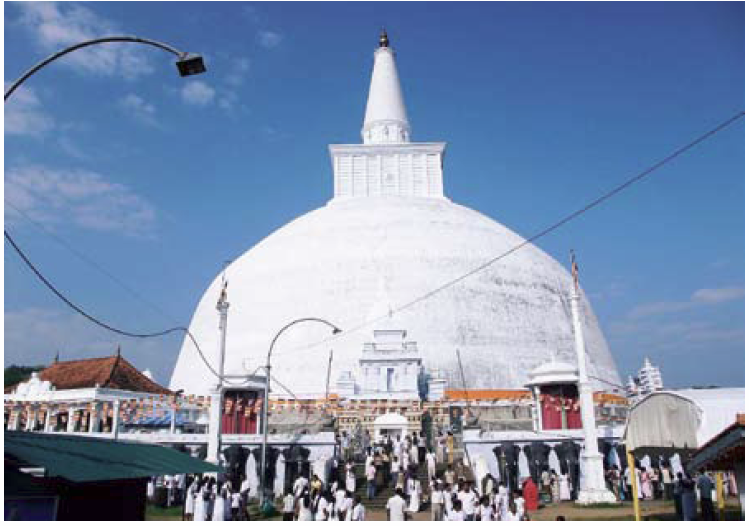 The Ruwanwelisaya (also written as Ruvanvalisaya) is a stupa in Sri Lanka, considered a marvel for its architectural qualities and sacred to many Buddhists all over the world. Simply known also as the Great Stupa, the Ruvanvalisaya was constructed by Dutthagamani after he became king in 161 BCE. Any list of the 8 Wonders of the Theravada Buddhist world must include at least one example from Sri Lanka, considering its importance in the history of Theravada Buddhism. When it was finally completed, it was one of the wonders of the ancient world, with a diameter of 90 meters at the base and a height of 92 meters (300 ft) and circumference of 292 meters (950 ft). The stupa is one of the world's tallest monuments and was the fifth tallest structure of any kind when it was built in approximately 161 BCE. 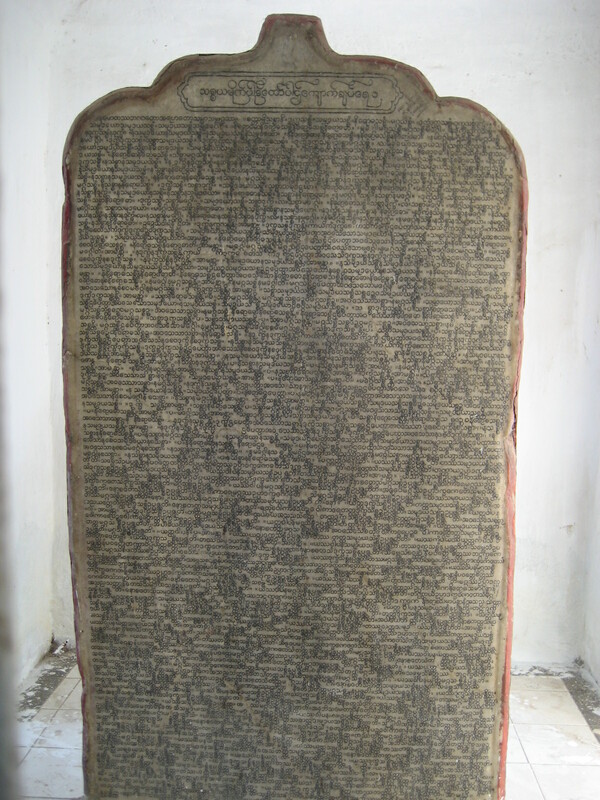 The Tipitaka is inscribed on 729 marbles slabs at Kuthodaw Pagoda, in Mandalay, Burma (Myanmar). The Tipitaka represents the oldest and original teachings of the Buddha. These slabs are considered as the world's largest book of any kind. 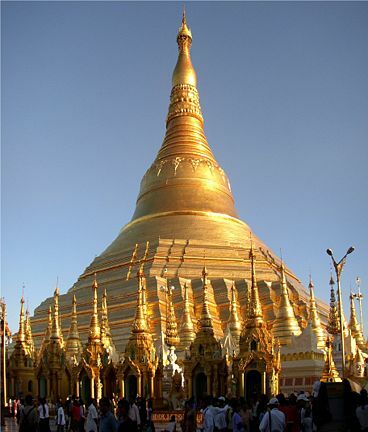 Shwedagon Pagoda is the holiest site in Burma (Myanmar). It was most likely built sometime between the 6th and 10th centuries. According to legends, there are relics from the last four Buddhas enshrined in the Pagoda. 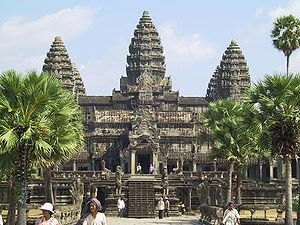 Angkor Wat in Cambodia is the largest Buddhist structure and complex in history. The outer wall encloses 820,000 square meters. It started as a Hindu temple in the 12th century and became a Buddhist temple about 100 years later and has remained a Theravada Buddhist temple ever since. 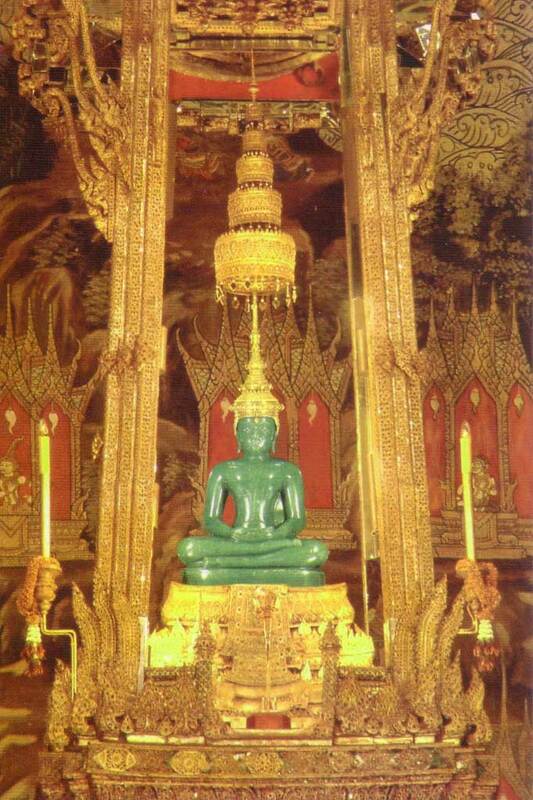 Located in Bangkok, Thailand, the Temple of the Emerald Buddha is considered the holiest temple in Thailand. The statue dates to 1434 and the temple was constructed beginning in 1785. The Global Pagoda is in Mumbai, India. The Global Pagoda was built out of gratitude to the Buddha, his teaching and the community of monks practicing his teaching. Its traditional Burmese design is an expression of S. N. Goenka's gratitude towards the country of Myanmar (Burma) for preserving the practice of vipassana. The inside of the pagoda is hollow and serves as a very large meditation hall with an area covering more than 6000 m2 (65,000 ft2). This magnificent structure represents the rapid spread of the Dhamma assisted by teachers such as S. N. Goenka who is the leader of the project and also that the Dhamma is coming back home, to India. In November 2006 the newspaper USA Today, named the internet as one of the Seven Wonders of the Modern World. This is appropriate for this Theravada Buddhist list too because a sizeable percentage of modern Buddhists now receive their Buddhist information and instruction off the internet, with reference sites such as Dhamma Wiki. Numerous online forums exist to discuss the Dhamma, such as Dhamma Wheel. Monks and nuns also participate in these forums and offer advice and teachings via blogs, websites, and forums. This page was last edited on 25 November 2011, at 16:50. This page has been accessed 183,454 times.